Preparing to move? It can be so draining. But if you keep things organized, it will save you time and energy in the long run. Think weeding is all you should do? 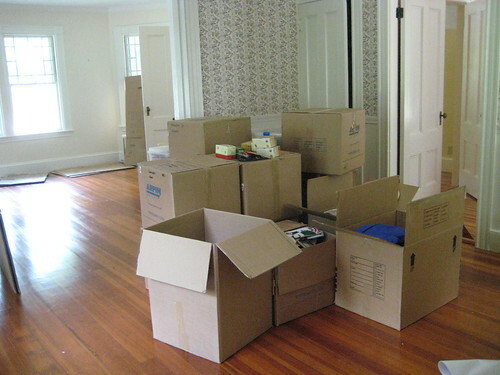 Here are some other things you can do to keep things organized during a move. Do you really need all those clothes? Some people will gasp at this, but there is a such thing as having too many clothes. You know half of them are probably not even your size anymore. Go through your clothing and donate what no longer fits or those items you never wear. If you're holding onto something for just the right moment, you may not ever wear it. Only keep what you actually wear, along with some type of formal attire if you have any. Speaking of formal wear, do you really need fifteen formal gowns? Really? How often do you wear them? If your answer is never or hardly ever, you don't need more than one. It's easy to use one "little black dress" as the base of your outfit and have it look completely different each time. I would even go so far as to say most people don't even need one. They can be rented if you actually have the occasion for one. Most people don't. If it's already there in your closet, you may as well make use of your favorite. Follow the three month rule. Excluding seasonal items, if you haven't used something in three months, give it to someone who will or recycle it. You have no use for it. Yes, I know that rug from the '70s may go back in style at some point. But part of the organization involved with moving is getting rid of things you don't need. You don't need that rug. You also don't need all those stuffed animals you should have gotten rid of as a kid or that cracked mirror that's peeling off your bedroom door. Organize unwanted items by donating or selling what's still useful, recycling what you can that isn't, and trashing what's left. Label everything and keep it neatly in a designated area. This has been a lifesaver as we prepare to move. Each time we pack something, it goes into a particular area of the house. If it's a box or container, it gets labeled. If it's furniture, it gets positioned in a way that it cannot be used. This helps prevent the dreaded unpacking of packed items. We try to keep that area as orderly as possible but with kids running around, it can be difficult. Kids don't like their items packed. They will try to unpack them. Packing them as securely and out of reach as possible helps, if you have little ones. A locked unused room or storage area may help. Tape each box shut once it's packed, to keep out kids AND adults. Again, kids don't like their items packed. So to prevent the kids from unpacking the boxes, it's a good idea to tape them all shut. We do this with all containers, even plastic storage bins. Duct tape is our preferred tape as it deters the kids better than standard packaging tape. It will take them longer to work at it and generally, they'll get caught before they get very far. Since I know you are thinking it, yes, sealing the boxes with tape helps prevent adults from unpacking too. It isn't foolproof, but it does help. When everything is taped up and ready to go, it is more likely to stay organized as you prepare to move.